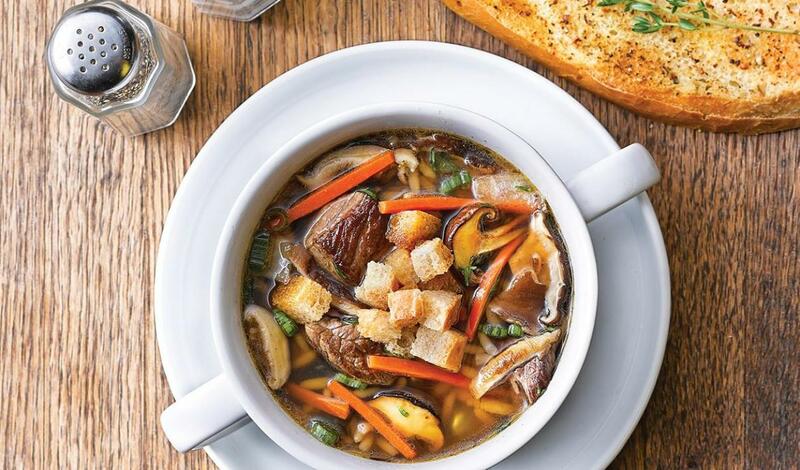 Wild mushrooms, fresh veggies and wild rice come together with tender braised beef for a thick, satisfying soup. Sweat onions and garlic in small amount of oil until translucent. Add carrots and sauté 3 minutes. Add wild mushrooms and sauté for 2-3 minutes. Add prepared Knorr® Professional Liquid Concentrated Beef Flavor Base and bring to a simmer. Add braised beef and wild rice – simmer 45 minutes or until rice is tender. Add thyme and green onions (reserve some for garnish). Garnish with additional green onions and croutons.